What’s your idea of a relaxed day or evening after work? Maybe a date with John Grisham or Gillian Flynn. Or how about Vikram Seth or Chimamanda Ngozi Adichie. Too serious? How about a fun and romantic evening with Chetan Bhagat or Nora Roberts? Where? In a cozy room, overlooking a bustling heritage city from high above…right in your home! Sounds like fantasy? Not at Signature One. 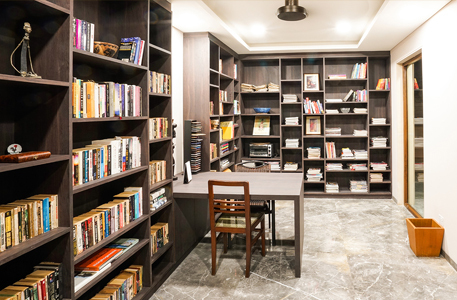 A beautiful yet cozy library, stacked from floor to ceiling with the best and latest books and authors is situated high on the terrace of this luxury residential complex. From here, the amazing view of the high-end malls and neon lights, the busy roads and lanes winding up and around the twin hills of Banjara and Jubilee, and several city highlights could however, distract you from the book that you picked up to read. Books take us to the past; to all those who have gone by and left us with their wisdom accumulated by their life experiences. It has a magical ability to bring the past to life through their actual words, unabridged and unrevised. Books are also our companions in a way that any digital media can ever be. The author speaks to us directly through their pages. It’s altogether a different experience to read a book sitting in a library. Reading a book involves a lot of attention, so library is the ideal place for reading books and exploring the world. There was a time when people made frequent trips to the library, got lost in the world of books and imagination. Let’s relive that era in the extremely well stocked library in Signature One. Introduce your kids to the world of books which is just an elevator trip away. Indulge them in the pleasure of reading. Like Jacqueline Kennedy once said “There are many little ways to enlarge your child’s world, Love of books is the best of all”. This terrace library is one place that the global residents of Signature One with their refined tastes and lifestyle would surely love to spend time. Let your reading become more enjoyable with solitude and the beautiful ambience. Enjoy reading, cause’ the world belongs to those who read!